← Peak Cable & Peak Car? Dr. Brent Stephens and his co-authors at the Illinois Institute of Technology attracted a good deal of popular press attention (TechCrunch Article) with their recent publication of, “Ultrafine paticle emissions from desktop 3-D Printers” in the journal of Atmospheric Environment. This is the first legitimate safety objection around 3D printing, which has long been a media and technologist darling (I’m in the dissenting camp), and while it is an initial concern, it coincides with growing awareness of how airborne particulate impacts health, wellness and safety. The EPA defines ultrafine particles as those under 100 nm. There is significant epidemiological research showing correlation between increased quantities of microparticles (which are bigger than ultrafine particles) and cardiovascular problems. The particle size distribution (from 10 nm – 150 nm) found by Dr. Stephens et al from IIT broken out by PLA vs ABS. Ultrafine particles are currently being studied by an EPA grant at the University of Rochester. Particles of this size are covered by the new US standards of the Air Quality Index (“AQI”), which by law requires the measurement of SO2, CO, O3, NO2, Pb and particulate matter. Currently particulate matter is measured at 10 micron (PM10) and 2.5 micron (PM2.5). [If we used the same abbreviation, ultrafine particles could be labeled PM0.1.] Even across the US where sensitivity to air pollution is high, at 10 and 2.5 micron, where the standards are defined and well known, it is widely known that measurement methods and their results vary dramatically by geography. With ultrafine particles we have reason to be concerned about their presence due to known health issues with larger particles at PM10 and PM2.5, however we are a long way away from being to reliably measure and implement any kinds of controls on a national basis. Stephens et al. showed that there were approximately 10.5 * 10^10 particles of each bin emitted by the printers working with ABS and a lesser amount for those working with PLA. If we were to take the current NAAQS standards about micrograms per cubic meter of air and then use an average particle diameter of 70 nm, include typical densities for PLA and ABS, we would expect that an unventilated 3D printer would hit the PM10, and both PM2.5 microgram boundaries between 4 seconds and 8.5 minutes of run time if there was no ventilation and it occupied a cubic meter. We are naively using the PM10 and PM2.5 numbers even though there is not a standard for PM0.10 – PM1.50, which would cover the results from IIT. Many popular press references to Stephens work cite benchmarking efforts in his paper which compares the concentration levels he finds to what has been shown in other studies to be near other conventional activities that have been studied for UFP emissions. 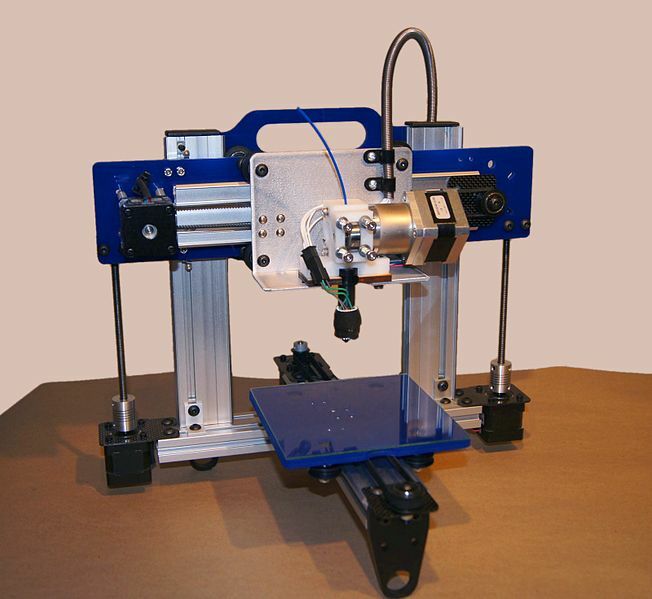 While this may create comfort in the population, the materials being used in a 3D printer may be different than that found in these more established practices – particularly those where food preparation is used. I do not know of any recipes which call for PLA, ABS or many of the other materials used in 3D printing / light manufacturing to be added to a meal prepared in a frying pan. Just as with any other filtration activity, the standards around UFP will be important to understanding the very existence of, in addition to the nature and scope of a potential problem. The ASHRAE standards around MERV have allowed for widespread adoption of filtration standards and served as the framework for similar standards in Europe. The DOE standards around HEPA enabled particulate standards which led to precision manufacturing in the nuclear, electronics and life science industries. Increased usage of AQI allows a better understanding of how particulate matter impacts global health and wellness. Developing similar standards for both UFP size and UFP composition will allow for better understanding of the problem as well as potential methods of abatement. Creating a filtration regime for any new potential pollutant or hazard is hard. The DOE and emerging global standards around HEPA focus on 0.3 um (300 nm) particulate – boulders compared to the fall smaller UFP’s studied by Stephens et al. The paper references that increased UFP concentrations were only seen for particulate smaller than 150 nm, which led the researchers to focus on the smallest 9/12 size bins identified in their initial planning. The HEPA standard is met when a filter collects 99.97% of 0.3 um particulate according to the ASME AG-1-2003 standard. There are three filtration mechanisms; interception (where a particle hits the filter media), impaction (where the particle is drawn into the filter media), and the most important for UFP – diffusion (where Brownian motion causes a collision between the particle and the filter media as the particle traverses across the filter media). These methods form a portfolio of capture mechanisms which combine to create the overall efficiency of the filter media. At particle sizes below 300 nm (0.3 um) diffusion is the dominant method – and diffusion holds this highest value method down to the lowest particle sizes measured of 10 nm. As can be seen in the exhibits, collection efficiency for diffusion are at 30% and less for particles in the range outlined for the 3D printer UFP study. One would expect that over time the safety approaches used for 3D printing would include what is seen as standard in similar applications – first, encapsulate the unit to protect the operator from the UFP flow. Second, have a steady flow of process air (as would be used with any volatile, flammable or otherwise potentially dangerous material) to keep concentrations low. Further, prior to releasing process air, be sure that any particulate is captured. For now, large banks of HEPA filters could potentially be sufficient. Depending on what materials are being used, activated carbon, scrubbers, or potentially even oxidation could be effective in treating waste air before release to the environment. This is primarily a scrap rate issue for the makers of 3D printers. A very small percentage of the raw material is not converted into a final good, but instead, converted into a potentially hazardous particulate aerosol. Further improvements in yield will reduce the issue. However, if productivity increases without improvements in yield, then the problem will only grow. For the 3D printer industry it would be valuable to look at the particulate hazards generated by the manufacturing practices which are being replaced. It would have been very useful to see what Dr. Stephens’ team at IIT could find at an injected molded plastics facility working with similar materials. This is the first legitimate complaint against 3D printing in what has otherwise been an easy path towards social acceptance. The technology is widely loved and hyped in the popular media. Will the industry players react in an organized fashion to address these issues? It would be a simple act to put together a working group to seek guidance from ASHRAE, DOE, INDA or other filtration bodies that have dealt with similar industry safety issues in the past. This entry was posted in Business, Disruption, Industry, Innovation, Materials Science and tagged 3D Printers, Filtration, HEPA, Most Penetration Particle, ULPA. Bookmark the permalink.